Hello dear readers, and welcome back to a new Crowded Table! 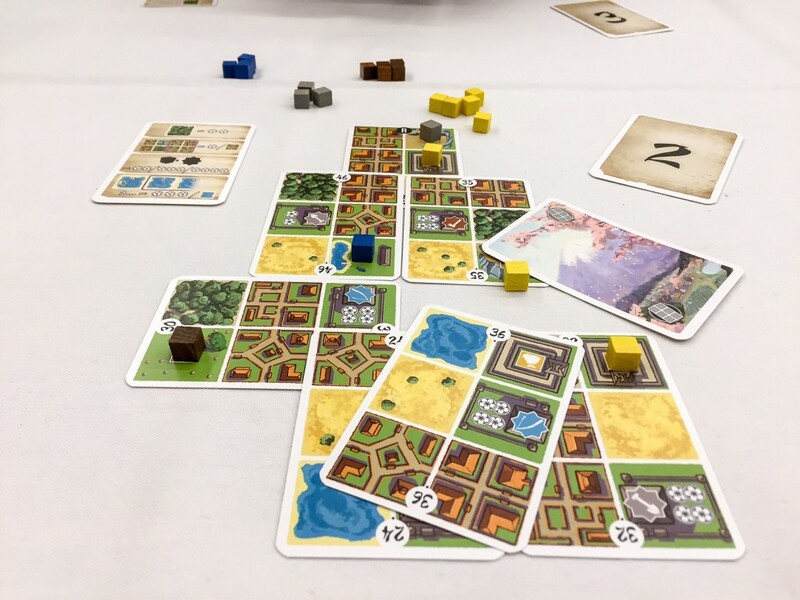 With both Origins Game Fair and RuthCon now behind me I have played a plethora of new titles with which I’d like to share my thoughts. What’s great about this particular Crowded Table is that not only have I played a ton of new games – I’ve also played many of them a ton of times! 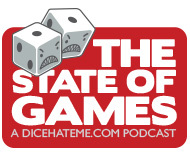 From here on out in my Crowded Table features, as well as any full reviews on the site, I will be stating how many times I’ve played the game, and with what player counts. If a game is played only 1 or 2 times you can consider my thoughts as an impression and I may need to explore the game further to discover nuances, faults, or shiny bits. If a game is played three times or more, then I consider my thoughts to be wholly review-worthy. Trying to sum up a Vital Lacerda game in about 200 words is like trying to shove a hippo into a VW Beetle, but I shall sally forth. In Lisboa, your job is to reconstruct the grand city of Lisbon after it was devastated by an earthquake, then a tsunami, and then three days of fires in 1755 – things were in a bit of disarray, to say the least. You’ll achieve all this by doing something as simple as playing a card from your hand every turn; of course, the choices of what to do with that card are myriad. You can place the card in your portfolio which will give you an immediate bonus, but also either a permanent boost to your influence, or a ship that can gain you victory points (wigs) for goods, or special powers like discounts when you have to spend money. You can also use the card to visit the Royal Court, taking actions from one of three nobles that will allow you to build shops in the ruined city for the opportunity to produce goods and gain wigs, build public buildings for even more prestige and wigs, or do things like build ships, influence the Cardinal for special abilities, gain royal favors, and more. 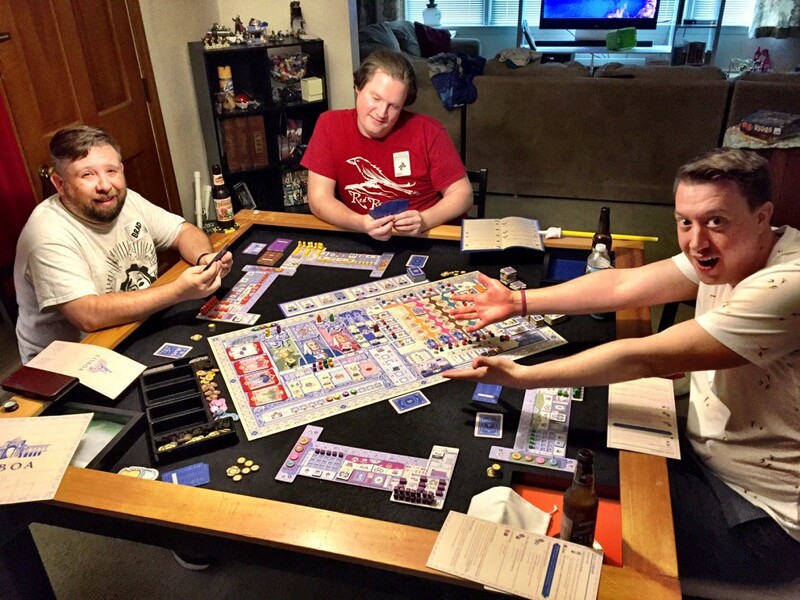 Although the game is exceedingly long (typically 3+ hours even without a rules explanation), and the time between turns isn’t swift, players are able to use royal favors to take follow actions during other player turns. This not only keeps players engaged during the long rebuilding process, but is also a key factor for success in the long run. Lisboa is not for the faint of heart, nor for those who have a limited schedule, but if you have the dedication and patience the game is rich with choice without cerebral overtaxation. In my opinion, it is Lacerda’s finest design accomplishment to date. When it comes to Kickstarter I tend to be a “set it and forget it” kind of backer. So when Sol: Last Days of a Star arrived on my doorstep last week I was pleasantly surprised since I only vaguely remember backing it. Nevertheless, I am certainly glad I did, as Sol – like Tavarua from late last year – far exceeded any of the vague notions I might have had about its unique gameplay. 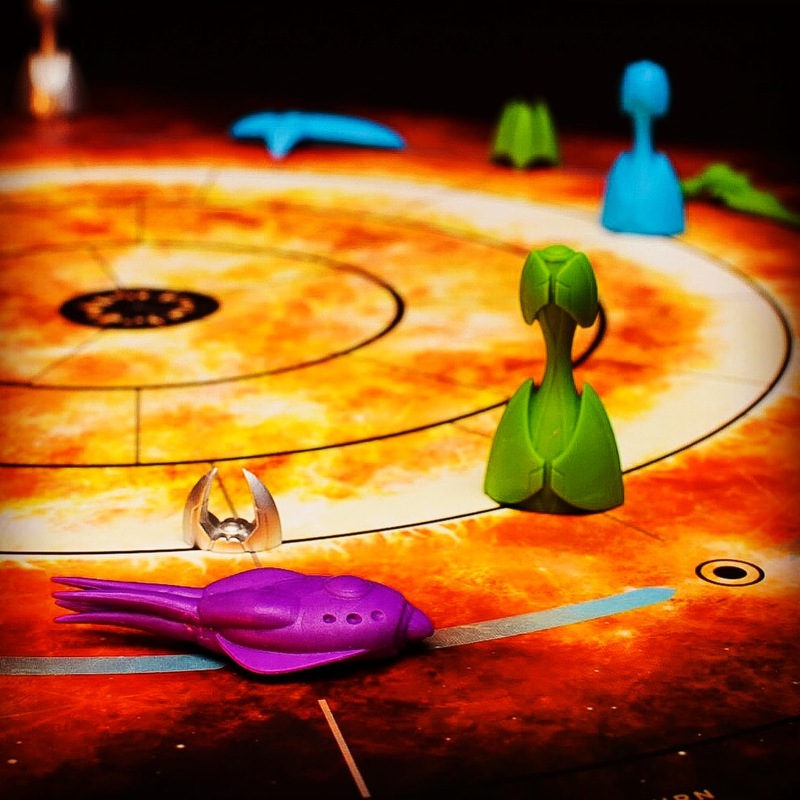 At its heart, Sol is a race-for-points game. You see, the sun is about to explode and you need to use all this future tech to harvest momentum from the dying star so your people can rocket out of the system in their Ark and colonize another dusty orb. The core of the system lies in your Sundivers – a horde of tiny ships that you maneuver around the sun to construct Energy Nodes (which, when activated, collect energy), Foundries (which, when activated, create more Sundivers out of collected energy), and Towers (which, when activated, transform collected energy into momentum for your Ark). You can activate other player’s structures if you’d like, but they get a bonus, and the deeper you travel into the sun the more powerful the effect a station will have. You can also fling your Sundivers into the heart of the sun for momentum. Oh, and complicating matters a bit more is that you can’t get deeper into the sun unless you use Gates, which creates an incredibly cool spatial- and movement-point allocation puzzle. And if all that wasn’t enough going on, when you activate stations you also draw a variable number of cards from the Instability deck which can a) give you a myriad of special abilities that changes from game to game, and b) set off Solar Flares that create a small bit of havoc that slowly counts down to the solar explosion and, thus, the end of the game. All in all, this is one surprisingly stellar game that I can’t wait to play again and can’t recommend enough. 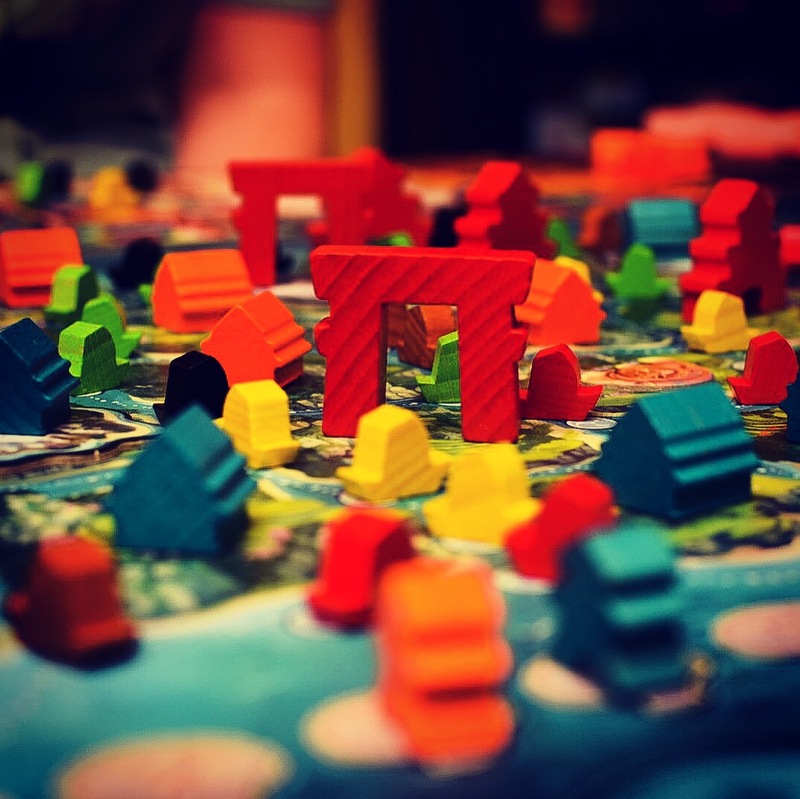 When Days of Wonder took a strange left turn into the realm of heavier Euros with Five Tribes back in 2014 the board game community at large gently scratched their heads in confusion but boldly trudged forth because it was beautiful, and it was Cathala. And, in the end, it was quite lovely, and quite thinky. Well, Bruno is back – along with Marc Paquien – and this time he’s up to his old, thinky tricks again. The goal in Yamataï is to make Queen Hamiko smile. Naturally, you do this by placing boats in five different colors along waterways to create different colored configurations and either earning culture (which you can spend to hire advisors with special abilities) or building buildings on islands for points. I guess the queen really likes boats and buildings or something. Anyway, this whole process takes a Very Long Time and the game has a variable turn order that is determined by which boat tile you select in a round. This means that if you go first one round and select, say, the number 10 boat (that means you’ll go last next round) in a four-player game you’ll probably have enough time to make a ham sandwich and catch up on some YouTube clips before your next turn comes around. If downtime is your jam then you’ll probably love Yamataï. As for me, I would recommend sticking to the 2-player game – or just break out Five Tribes again. Let me get this out of the way first: Dice Forge is very, very shiny. The production is absolutely gorgeous, and the toy factor of the swappable die faces is undeniably appealing. Now that’s out of the way, let’s get real: If you’re likely to flip the table because dice ruined your whole game, Dice Forge is definitely not for you. In the game you’re rolling your dice and collecting three different resources to either buy cards with words or upgrades to your die faces. Even though the game only lasts 10 rounds you’re going to upgrade your die faces a lot. And, without an ounce of hyperbole, you’re about 90% sure to roll the same miserable faces you started the game with despite upgrading five times. You will curse. You will curse a lot. Scoring upgrades, gaining cards with abilities, and rolling your dice are all nice, fun activities, but once you’re done with all of that after 10 rounds you’re just left with a slight feeling of ennui – of wanting more. I’ll be sure to post an update to my thoughts and score once I play more, but for now I’m passing these dice to the next player. By now I’m sure many of you dear readers have come across other reviews, Tweets, Instagram posts, podcast notes, and carrier pigeon messages that have mentioned what so and so and their Aunt Bea thought of this supposed “Splendor Killer,” so let me just be succinct: It’s a Splendor Killer. It is no secret that I was not a huge fan of the hottest game of 2014, so it was with trepidation that I plunked down my hard-earned cash at Origins to be an early adopter of Splendor’s spiritual successor. That said, I’m so glad that I did. The crux of the game is thus: On your turn, you take one action, typically by playing a card from your hand to get some cubes of four different colors, or to convert those cubes to other colored cubes. Then, later, you turn those cubes you’ve gathered and transformed in to claim a card that has points on it. Sometimes you’ll pick your cards back up. Rinse and repeat until five of those points cards have been taken (six in a 2 or 3-point game). And that’s it. 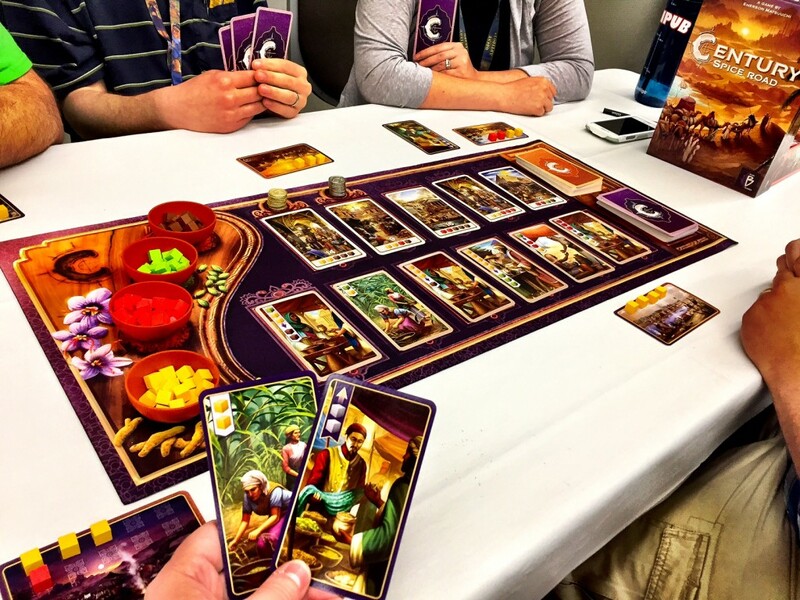 Century: Spice Road is fast, fun, and player-count friendly. The rules fit on a single sheet of paper, are easy to remember and teach without said sheet of paper, and there are rarely any questions or clarifications needed during play. With all the cubes and cube conversions flying around, it could truly be called “Euro: The Euro Game” but it doesn’t matter – this little gem from Emerson Matsuuchi is worth the hype. Plus, it has camels. What more could you want? Just get this one, ok? Seriously. What with my close involvement with Unpub, and watching Twitter constantly, and generally putting my ear to the game design ground I like to think I’m generally aware of the next best thing coming out of the design community. And, so, it was with great surprise that I came across a modestly-sized pink box with J. Alex Kevern’s name and a female robot on it at Origins in the Renegade Games booth. Naturally, I bought it instantly. 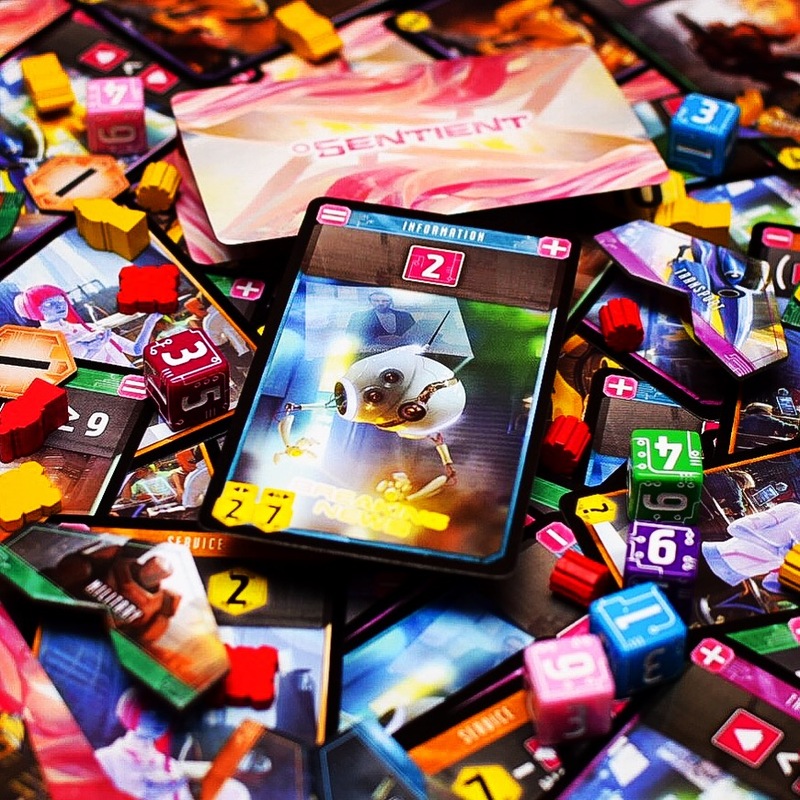 Sentient is played over three rounds; before each round, each player rolls five dice and places them in the appropriate slots on their player board. Then, five different robot types are placed into stations in the center of the table. Players take turns placing Agents over those stations to gain the bots, which they then place into the slots on their player boards. The trick is that each bot scores for the round based on the dice on either side of the card, and the bot may change the value on the dice depending on modifiers on the top left or right of the card. That particular puzzle is cool enough for a great game, but the Agents you placed earlier also act for area control; the player with the most influence over a particular spot earns an “investor” chevron that can multiply the value of each robot type at the end of the game. 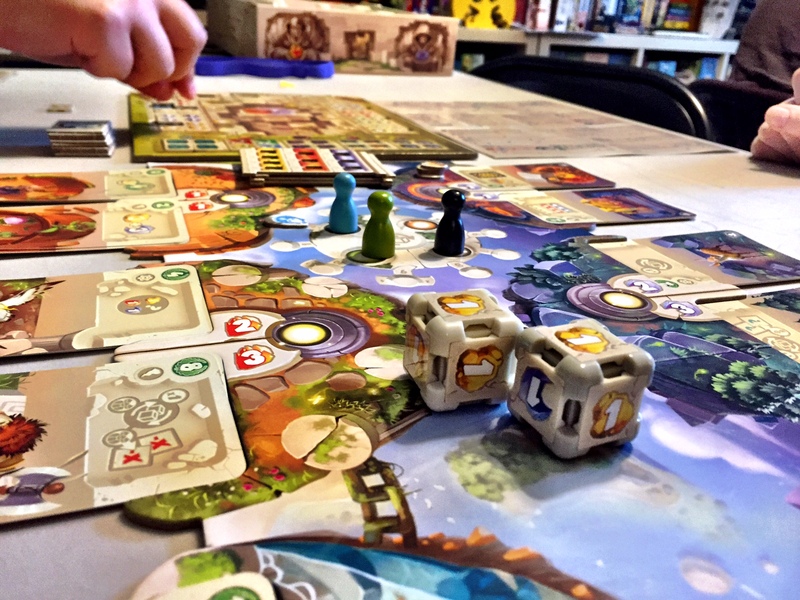 It’s a bit hard to explain in a few printed words, but after playing a round or two of the actual game you’ll not only grasp the concept of each aspect, you’ll also have that grand “puzzle buzz” that comes from figuring out something really super cool. This is one sleeper gem you don’t want to miss. Your six word review and 6 out of 6 rating for Honshu made me laugh. That review is as simple and straightforward as how the game plays. It’s good. Enough said.